1. Marinate the mutton pieces with the remaining ingredients numbered 1 for at least 30 minutes or overnight in the refrigerator. Take it out of the refrigerator 30 minutes before cooking. 3. Heat 5 – 6 tbsp ghee in a heavy-bottomed vessel. Add all the ingredients numbered 3 and enough salt. Cook for at least 1 hour stirring in between, until it turns brown. Add 1/4 cup chopped cilantro and mint. Mix well. Add the mutton pieces and 1/2 cup fried onion. Cook for 6 – 7 minutes. Add 1/2 cup hot water and mix well. Transfer this to a pressure cooker. 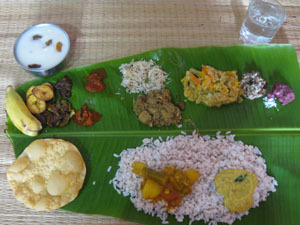 Cook for 4 – 5 whistles until the mutton pieces turn soft. Reserve 3/4 – 1 cup of the gravy (use this while cooking rice to give an extra flavor to the rice). 3. 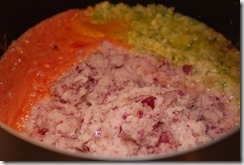 To cook biriyani rice – Rinse and soak rice in enough water for 30 minutes. Drain well. 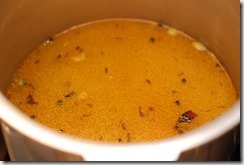 Heat 3 tbsp ghee in a heavy-bottomed pan or a large 5 or 6 liter pressure cooker. Add the whole spices and stir until fragrant. Add drained rice and fry for a minute. Add 5 cups of hot water and 1 cup beef stock/gravy that you reserved before. Bring to a boil and taste-check for salt. The water should be slightly salty. Cover with lid and cook until steam starts coming out profusely (if you are using a cooker). Put the cooker weight and cook for 2 – 3 minutes over low heat. Switch off. Open the lid after 10 – 15 minutes. The rice will be perfectly done. Fluff the rice gently using a fork. 4. To layer – In a heavy-bottomed vessel smeared with ghee, spread half of the cooked mutton masala at the bottom. Top it with 1/4 cup chopped mint and cilantro. Top it with half of the cooked ghee rice. 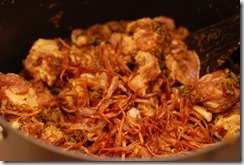 Sprinkle fried onion, cashews, raisins, chopped mint, cilantro and a pinch of garam masala powder. Spread the remaining mutton masala on top followed by remaining ghee rice. Sprinkle fried onion, a pinch of garam masala powder or biriyani masala powder, fried cashews, raisins, chopped mint, cilantro, saffron milk and 2-3 tsp melted ghee. Cover tightly with an aluminium foil. Bake at 400 F for 15 – 20 minutes. OR Heat a large tawa over medium-high heat. Once hot, bring down the heat to low. Place the biriyani pot on top of the tawa. Cook over medium heat for 4 minutes. Bring down the heat to low and cook for 5 minutes. Switch off. Let it rest unopened for another 10 – 15 minutes in the biriyani pot. Serve hot with raita, boiled eggs, biriyani chammanthi, pappadam and lemon pickle. From where do you get mutton. ? Thanks for your feedback! 🙂 I buy mutton from a local butcher..